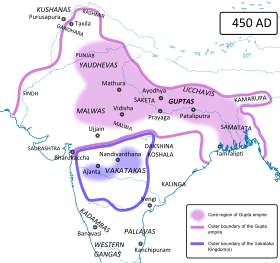 The Gupta Empire was an ancient Indian empire, founded by Sri Gupta, which existed at its zenith from approximately 320 to 550 CE and covered much of the Indian subcontinent. The peace and prosperity created under the leadership of the Guptas enabled the pursuit of scientific and artistic endeavours. This period is called the Golden Age of India and was marked by extensive inventions and discoveries in science, technology, engineering, art, dialectic, literature, logic, mathematics, astronomy, religion, and philosophy that crystallized the elements of what is generally known as Hindu culture. Chandragupta I, Samudragupta, and Chandragupta II were the most notable rulers of the Gupta dynasty. The 4th century CE Sanskrit poet Kalidasa credits the Guptas with having conquered about twenty one kingdoms, both in and outside India, including the kingdoms of Parasikas, the Hunas, the Kambojas, tribes located in the west and east Oxus valleys, the Kinnaras, Kiratas etc. The high points of this cultural creativity are magnificent architecture, sculptures and paintings. The Gupta period produced scholars such as Kalidasa, Aryabhata, Varahamihira, Vishnu Sharma and Vatsyayana who made great advancements in many academic fields. Science and political administration reached new heights during the Gupta era. Strong trade ties also made the region an important cultural center and set the region up as a base that would influence nearby kingdoms and regions in Burma, Sri Lanka, and Southeast Asia. The earliest available Indian epics are also thought to have been committed to written texts around this period. The empire gradually declined because of many factors such as substantial loss of territory and imperial authority caused by their own erstwhile feudatories and the invasion by the Huna peoples (Ephthalite Huns) from Central Asia. After the collapse of the Gupta Empire in the 6th century, India was again ruled by numerous regional kingdoms. A minor line of the Gupta clan continued to rule Magadha after the disintegration of the empire. These Guptas were ultimately ousted by Vardhana ruler Harsha, who established his empire in the first half of the 7th century. There are contradictory theories regarding the original homeland of the Guptas. 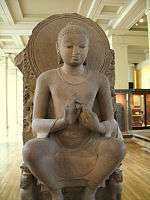 Meditating Buddha from the Gupta era, 5th century CE. There is controversy among scholars about the original homeland of the Guptas. Jayaswal has pointed out that the Guptas were originally inhabitants of Prayaga (Allahabad), Uttar Pradesh, in north India, as the vassal of the Nagas or Bhaarshivas. Thereafter they rose in prominence. Another scholar, Gayal supported the theory of Jaiswal, suggesting that the original home of the Guptas was Antarvedi embracing the regions of Oudh and Prayag. These historians have derived their theory from several Gupta Dynasty coins found in those regions, and this study of numismatic evidence led to the theory that the Guptas were the original inhabitants of that region of northeastern India. However another historian of this time in Indian history, Ganguli, has offered a different view about the original Gupta homeland. According to him the Guptas homeland is further south, the Murshidabad region of Bengal, and not Magadha in Bihar. He based his theory on the statement of the Chinese Buddhist monk, Yijing (I-Tsing), who visited India during 675 and 695 CE. Fleet and other historians however criticize Ganguli's theory because Sri Gupta ruled during the end of the 3rd century, but Yijing placed him at the end of the 2nd century. Hence the theory of historians, who have provided their views based on the accounts of Yijing, are considered less valid than theories based on other sources such as coinage. From these theories, several conflicting opinions about the original homeland and the Empire of the Guptas are available. According to Allan and other scholars, the Guptas were originally concentrated in the region of Magadha and from there they extended their sway to Bengal. According to other groups, the original homeland of the Guptas was Varendri or the Varendra Bhumi in Bengal, wherefrom they extended their Empire to Magadha. Whatever the theory is, the rule of the Guptas initiated the Golden Age in history of ancient India and with passage of time they became the sole authority of entire Northern India. 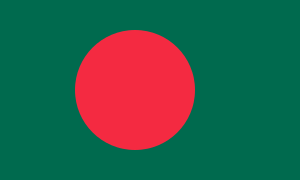 Bengali historians like HC Raychoudhuri the Guptas originated from the Varendri region which is now part of Rangpur and Rajshahi Division of modern-day Bangladesh. DC Ganguly on the other hand considers the surrounding region of Murshidabad as the original home of the Guptas. The most likely time for the reign of Sri Gupta is c. 240–280. His son and successor Ghatotkacha ruled probably from c. 280–319. 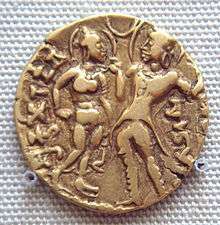 In contrast to their successor, Chandragupta I, who is mentioned as Maharajadhiraja, he and his son Ghatotkacha are referred to in inscriptions as Maharaja At the beginning of the 4th century, the Guptas established and ruled a few small Hindu kingdoms in Magadha and around modern-day Bihar. Yijing also mentioned about Sri Gupta in his writings. He was succeeded by his son Ghatotkacha. Queen Kumaradevi and King Chandragupta I, depicted on a coin of their son Samudragupta, 335–380. Ghatotkacha (reigned c. 280–319 CE), had a son named Chandragupta (reigned c. 320–335 CE) (not to be confused with Chandragupta Maurya (322–298 BCE), founder of the Mauryan Empire.) In a breakthrough deal, Chandragupta was married to Kumaradevi, a Lichchhavi princess—the main power in Magadha. With a dowry of the kingdom of Magadha (capital Pataliputra) and an alliance with the Licchavis of Nepal, Chandragupta set about expanding his power, conquering much of Magadha, Prayaga and Saketa. He established a realm stretching from the Ganges River to Prayaga (modern-day Allahabad) by 321. He assumed the imperial title of Maharajadhiraja. He expanded his empire through marriage alliances. Samudragupta, Parakramanka succeeded his father in 335, and ruled for about 45 years, until his death in 380. He took the kingdoms of Ahichchhatra and Padmavati early in his reign. He then attacked the Malwas, the Yaudheyas, the Arjunayanas, the Maduras and the Abhiras, all of which were tribes in the area. By his death in 380, he had incorporated over twenty kingdoms into his realm and his rule extended from the Himalayas to the river Narmada and from the Brahmaputra to the Yamuna. He gave himself the titles King of Kings and World Monarch. Historian Vincent Smith described him as the "Indian Napoleon". He performed Ashwamedha yajna in which a horse with an army is sent to all the nearby territories of friends and foes.These territorial kings on arrival either accept the King's alliance, who is performing this yajna or fight if they don't. The stone replica of the horse, then prepared, is in the Lucknow Museum. The Samudragupta Prashasti inscribed on the Ashokan Pillar, now in Akbar’s Fort at Allahabad, is an authentic record of his exploits and his sway over most of the continent. Samudragupta was not only a talented military leader but also a great patron of art and literature. He conquered what is now Kashmir and Afghanistan enlarging the empire. The important scholars present in his court were Harishena, Vasubandhu and Asanga. He was a poet and musician himself. He was a firm believer in Hinduism and is known to have worshipped Lord Vishnu. He was considerate of other religions and allowed Sri Lanka's Buddhist king Sirimeghvanna to build a monastery at Bodh Gaya. That monastery was called by Xuanzang as the Mahabodhi Sangharama. He provided a gold railing around the Bodhi Tree. Although, the narrative of the Devichandragupta is not supported by any contemporary epigraphical evidence, the historicity of Rama Gupta is proved by his Durjanpur inscriptions on three Jaina images, where he is mentioned as the Maharajadhiraja. A large number of his copper coins also have been found from the Eran-Vidisha region and classified in five distinct types, which include the Garuda, Garudadhvaja, lion and border legend types. The Brahmi legends on these coins are written in the early Gupta style. In opinion of art historian Dr. R. A. Agarawala, D. Litt., Rama Gupta may be the eldest son of Samudragupta. He became king because of being the eldest. It may be a possibility that he was dethroned because of not being the worthy enough to rule and his younger brother Chandragupta II took over. According to the Gupta records, amongst his sons, Samudragupta nominated prince Chandragupta II, born of queen Dattadevi, as his successor. Chandragupta II, Vikramaditya (the Sun of Power), ruled from 375 until 415. He married a Kadamba princess of Kuntala and of Naga lineage (Nāgakulotpannnā), Kuberanaga. His daughter Prabhavatigupta from this Naga queen was married to Rudrasena II, the Vakataka ruler of Deccan. His son Kumaragupta I was married to Kadamba princess of Karnataka region. Chandragupta II expanded his realm westwards, defeating the Saka Western Kshatrapas of Malwa, Gujarat and Saurashtra in a campaign lasting until 409, but with his main opponent Rudrasimha III defeated by 395, and crushing the Bengal (Vanga) chiefdoms. This extended his control from coast-to-coast, established a second capital at Ujjain and was the high point of the empire. 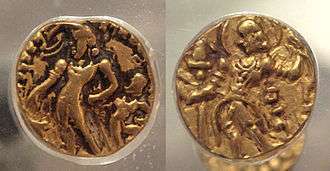 Gold coins of Chandragupta II. 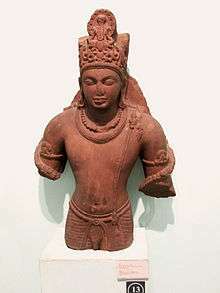 Despite the creation of the empire through war, the reign is remembered for its very influential style of Hindu art, literature, culture and science, especially during the reign of Chandragupta II. Some excellent works of Hindu art such as the panels at the Dashavatara Temple in Deogarh serve to illustrate the magnificence of Gupta art. Above all it was the synthesis of elements that gave Gupta art its distinctive flavour. 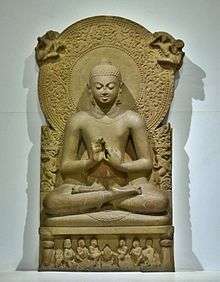 During this period, the Guptas were supportive of thriving Buddhist and Jain cultures as well, and for this reason there is also a long history of non-Hindu Gupta period art. 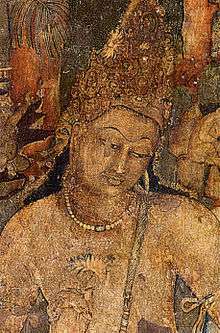 In particular, Gupta period Buddhist art was to be influential in most of East and Southeast Asia. Many advances were recorded by the Chinese scholar and traveller Faxian (Fa-hien) in his diary and published afterwards. 4th century Sanskrit poet Kalidasa, credits Chandragupta Vikramaditya with having conquered about twenty one kingdoms, both in and outside India. After finishing his campaign in the East and West India, Vikramaditya (Chandragupta II) proceeded northwards, subjugated the Parasikas, then the Hunas and the Kambojas tribes located in the west and east Oxus valleys respectively. Thereafter, the king proceeds across the Himalaya and reduced the Kinnaras, Kiratas etc. and lands into India proper. The Brihatkathamanjari of the Kashmiri writer Kshemendra states, King Vikramaditya (Chandragupta II) had "unburdened the sacred earth of the Barbarians like the Sakas, Mlecchas, Kambojas, Yavanas, Tusharas, Parasikas, Hunas, etc. by annihilating these sinful Mlecchas completely". 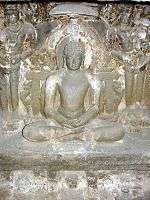 Fa Hien, a Chinese Buddhist, was one of the pilgrims who visited India during the reign of Gupta emperor Chandragupta II. He started his journey from China in 399 and reached India in 405. During his stay in India up to 411, he went on a pilgrimage to Mathura, Kannauj, Kapilavastu, Kushinagar, Vaishali, Pataliputra, Kashi and Rajagriha and made careful observations about the empire's conditions. Fa Hien was pleased with the mildness of administration. The Penal Code was mild and offences were punished by fines only. From his accounts, the Gupta Empire was a prosperous period, until the Rome-China trade axis was broken with the fall of the Han dynasty, the Guptas' did indeed prosper. His writings form one of the most important sources for the history of this period. Silver coin of the Gupta King Kumaragupta I (Coin of his Western territories, design derived from the Western Satraps). Obv: Bust of king with crescents, with traces of corrupt Greek script. Rev: Garuda standing facing with spread wings. Brahmi legend: Parama-bhagavata rajadhiraja Sri Kumaragupta Mahendraditya. 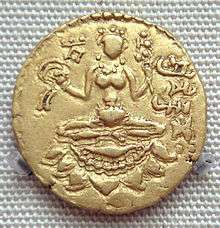 Chandragupta II was succeeded by his second son Kumaragupta I, born of Mahadevi Dhruvasvamini. Kumaragupta I assumed the title, Mahendraditya. He ruled until 455. Towards the end of his reign a tribe in the Narmada valley, the Pushyamitras, rose in power to threaten the empire. A Buddhist university was built by him in Nalanda, present day Bihar. Skandagupta, son and successor of Kumaragupta I is generally considered to be the last of the great Gupta rulers. He assumed the titles of Vikramaditya and Kramaditya. He defeated the Pushyamitra threat, but then was faced with invading Hephthalites or "White Huns", known in India as the Sweta Huna, from the northwest. He repulsed a Huna attack c. 455, But the expense of the wars drained the empire's resources and contributed to its decline. Skandagupta died in 467 and was succeeded by his agnate brother Purugupta. Following Skandagupta's death, the empire was clearly in decline. He was followed by Purugupta (467–473), Kumaragupta II (473–476), Budhagupta (476–495), Narasimhagupta (495—? ), Kumaragupta III (530—540), Vishnugupta(540—550), two lesser known kings namely, Vainyagupta and Bhanugupta. In the 480's the Hephthalites broke through the Gupta defenses in the northwest, and much of the empire in the northwest was overrun by the Hun by 500. The empire disintegrated under the attacks of Toramana and his successor Mihirakula. It appears from inscriptions that the Guptas, although their power was much diminished, continued to resist the Huns. The Hun invader Toramana was defeated by Bhanugupta in 510. The Huns were defeated and driven out of India in 528 by a coalition consisting of Gupta emperor Narasimhagupta and the king Yashodharman from Malwa. The succession of the 6th-century Guptas is not entirely clear, but the tail end recognized ruler of the dynasty's main line was king Vishnugupta, reigning from 540 to 550. In addition to the Hun invasion, the factors, which contribute to the decline of the empire include competition from the Vakatakas and the rise of Yashodharman in Malwa. 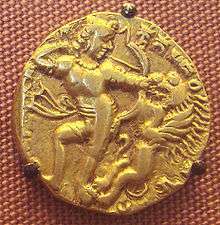 Gold coin of Gupta era, depicting a Gupta king holding a bow. The Imperial Guptas couldn't have achieved their successes through force of arms without an efficient martial system. Historically, the best accounts of this come not from the Hindus themselves but from Chinese and Western observers. However, a contemporary Indian document, regarded as a military classic of the time, the Siva-Dhanur-veda, offers some insight into the military system of the Guptas. The Guptas seem to have relied heavily on infantry archers, and the bow was one of the dominant weapons of their army. The Hindu version of the longbow was composed of metal, or more typically bamboo, and fired a long bamboo cane arrow with a metal head. Unlike the composite bows of Western and Central Asian foes, bows of this design would be less prone to warping in the damp and moist conditions often prevalent to the region. The Indian longbow was reputedly a powerful weapon capable of great range and penetration and provided an effective counter to invading horse archers. Iron shafts were used against armored elephants and fire arrows were also part of the bowmen's arsenal. India historically has had a prominent reputation for its steel weapons. One of these was the steel bow. Because of its high tensility, the steel bow was capable of long range and penetration of exceptionally thick armor. These were less common weapons than the bamboo design and found in the hands of noblemen rather than in the ranks. Archers were frequently protected by infantry equipped with shields, javelins, and longswords. The Guptas also had knowledge of siegecraft, catapults, and other sophisticated war machines. A study of the epigraphical records of the Gupta empire shows that there was a hierarchy of administrative divisions from top to bottom. The empire was called by various names such as Rajya, Rashtra, Desha, Mandala, Prithvi and Avani. 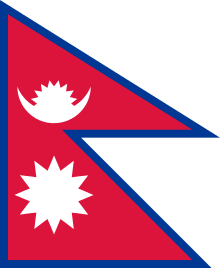 It was divided into 26 provinces, which were styled as Bhukti, Pradesha and Bhoga. Provinces were also divided into Vishayas and put under the control of the Vishayapatis. A Vishayapati administered the Vishaya with the help of the Adhikarana (council of representatives), which comprised four representatives: Nagarasreshesthi, Sarthavaha, Prathamakulike and Prathama Kayastha. A part of the Vishaya was called Vithi. There were also trade links of Gupta business with the Roman empire. Scholars of this period include Varahamihira and Aryabhata, who is believed to be the first to come up with the concept of zero, postulated the theory that the Earth moves round the Sun, and studied solar and lunar eclipses. Kalidasa, who was a great playwright, who wrote plays such as Shakuntala, and marked the highest point of Sanskrit literature is also said to have belonged to this period. The famous Sushruta Samhita, which is a Sanskrit redaction text on all of the major concepts of ayurvedic medicine with innovative chapters on surgery, dates to the Gupta period. Chess is said to have originated in this period, where its early form in the 6th century was known as caturaṅga, which translates as "four divisions [of the military]" – infantry, cavalry, elephants, and chariotry – represented by the pieces that would evolve into the modern pawn, knight, rook, and bishop, respectively. Doctors also invented several medical instruments, and even performed operations. The Indian numerals which were the first positional base 10 numeral systems in the world originated from Gupta India. The ancient Gupta text Kama Sutra is widely considered to be the standard work on human sexual behavior in Sanskrit literature. The Indian scholar Vatsyayana. Aryabhata, a noted mathematician-astronomer of the Gupta period proposed that the earth is round and rotates about its own axis. He also discovered that the Moon and planets shine by reflected sunlight. Instead of the prevailing cosmogony in which eclipses were caused by pseudo-planetary nodes Rahu and Ketu, he explained eclipses in terms of shadows cast by and falling on Earth. Borobudur in Java, Indonesia. The building’s design in Gupta architecture reflects India's influence on the region. ↑ Nehra, R.K. Hinduism and Its Military Ethos. Lancer Publishers,2010. Retrieved 2012-08-25. 1 2 Brannigan, Michael C. Striking a Balance: A Primer in Traditional Asian Values. Rowman & Littlefield, 2010. Retrieved 2012-08-25. ↑ Sharma, R.S. Early Medieval Indian Society: A Study in Feudalisation. Books.google.co.in. Retrieved 2012-06-06. ↑ List of Altekar's publications in the Open Library. ↑ "Founder of the Gupta Empire Maharaja Sri Gupta". theindianhistory.org. ↑ Smith, Vincent A. (1999). The Early History of India: From 600 B.C. 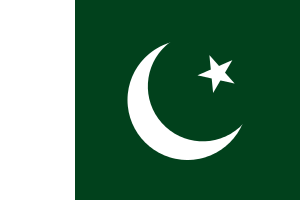 to the Muhammadan Conquest. Atlantic. p. 289. ISBN 81-7156-618-9. ↑ Agarwal, Ashvini (1989). Rise and Fall of the Imperial Guptas. Delhi: Motilal Banarsidass. pp. 153–9. ISBN 81-208-0592-5. ↑ Bajpai, K.D. (2004). Indian Numismatic Studies. New Delhi: Abhinav Publications. pp. 120–1. ISBN 81-7017-035-4. ↑ ata shrivikramadityo helya nirjitakhilah Mlechchana Kamboja. Yavanan neechan Hunan Sabarbran Tushara. Parsikaanshcha tayakatacharan vishrankhalan hatya bhrubhangamatreyanah bhuvo bharamavarayate (Brahata Katha, 10/1/285-86, Kshmendra). ↑ Cf:"In the story contained in Kathasarit-sagara, king Vikarmaditya is said to have destroyed all the barbarous tribes such as the Kambojas, Yavanas, Hunas, Tokharas and the, National Council of Teachers of English Committee on Recreational Reading – Sanskrit language. ↑ Prasanna Rao Bandela (1 January 2003). Coin splendour: a journey into the past. Abhinav Publications. pp. 112–. ISBN 978-81-7017-427-1. Retrieved 21 November 2011. ↑ Singh, Upinder (2008). A History of Ancient and Early Medieval India: From the Stone Age to the 12th Century. New Delhi: Pearson Education. p. 480. ISBN 978-81-317-1677-9. 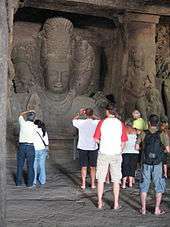 ↑ "Wonderful Indonesia - Borobudur: A Wonder of Indonesia History". Indonesia.travel. 26 September 2012. Retrieved 2013-01-26. Wikisource has the text of the 1911 Encyclopædia Britannica article Gupta. Wikimedia Commons has media related to Gupta Empire. Behl, Benoy K. (3 November 2007). "Mind over matter". Frontline. Chennai: The Hindu. 24 (22).